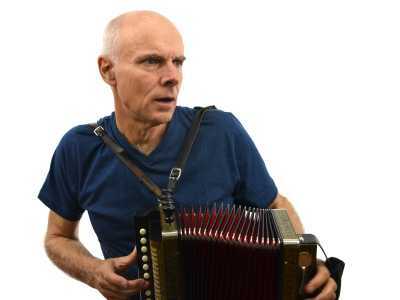 Tony Eyers was introduced to the accordion by rockabilly bass player Doug Bull, who rescued a Hohner single row button accordion from a demolition site, and passed it on. It sat on a shelf for some years until Tony read “Accordion Crimes”, by E. Annie Proulx. Anyone reading this book risks becoming an accordion player. As Tony found out. He also plays harmonica, and is the creator of Harmonica Academy. The accordion bug has taken hold however, he now owns around 15, mostly Hohners. His harmonica style is based on traditional bluegrass and old time tunes, which have migrated to his accordions. Hunter Eyers started with the violin, with lessons through his school. After a year he asked his Dad for accordion lessons. His parents then got him a restored 1930’s Hohner Liliput accordion, in return for continuing with violin. 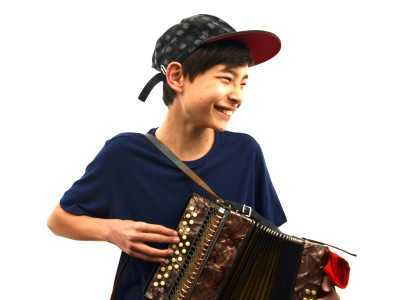 Hunter has learnt his father’s tunes, and now plays them as well, if not better than his teacher, despite being just 11. He also has a single row Castagnari Max accordion in D, currently the best instrument in the house.